To mark the launch of a new Charity of the Year partnership between Air Ambulances UK and the Government’s Valuation Office Agency, on 13 July employee Adrian Hirst made an emotional visit to meet the team from Yorkshire Air Ambulance that saved his life following a horrific motorbike accident in which he was critically injured last year. 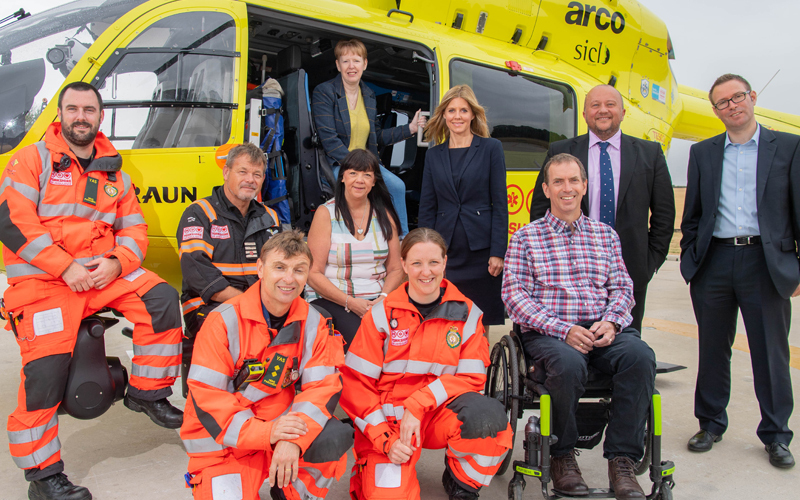 The VOA’s more than 3,000 employees overwhelmingly voted for Air Ambulances UK to be its Charity of the Year following Adrian’s accident near York in March 2017. The accident left him at the roadside with life-threatening injuries including a severed spinal cord, broken pelvis, hip, neck, shoulder, wrist and ribs as well as a bleed on his brain. In such critical circumstances, there is not always time to get a patient to the hospital. Getting the hospital to a patient is sometimes the only way to help prevent loss of life at the scene. That is when the speed and skills of one of the UK’s 21 local air ambulance charities can be the only way to save a life. The aviation excellence of the helicopter pilots and pre-hospital advanced medical capabilities of the Critical Care Teams are global-leading. On 11th March last year it was Paramedics Lisa Dempster, Lee Greenwood and pilot Captain Chris Attril forming and Critical Care Team from Yorkshire Air Ambulance who flew to Adrian and performed the hospital-level treatment on him which saved his life. The Team’s advanced life-saving treatment continued on-board the rapid helicopter transfer to hospital, effectively saving his life a second time. The Charity of the Year partnership will see VOA employees raise funds to help the collective life-saving work of the nation’s air ambulance charities through an exciting range of air-themed and other challenge events, office and social activities, payroll giving and much more. VOA senior executives Thomas Lindie, Operations Director, and David Nicholls, Head of People and Advisory Services, accompanied Adrian to the Yorkshire Air Ambulance Airbase visit at Nostell Priory near Wakefield. Adrian’s wife Karen, who was riding pillion and badly injured in the accident, also attended.